Note:- Applicants who have FAILED in PABT (Pilot Aptitude Battery Test) earlier are not eligible for Pilot Entry, but can apply for the Observer Entry scheme. (a) General Candidates. Agraduate degree in any discipline with minimum 60% marks. Should have qualified 10+2 level with Mathematics & Physics. (b) CPL Holders. A graduate degree in any discipline with minimum 60% marks. Should have qualified 10+2 level with Mathematics and Physics. The candidate must be in possession of current CPL issued by DGCA (India). Note:- Candidates who have not completed their Degree (i.e. appearing candidates) need not apply. 5. (a) Height and Weight. A minimum height for men 162.5 cms and for women 152 cms with correlated weight, leg length, sitting height and thigh length. (b) Eye Sight. Minimum acceptable vision standard for distant vision 6/6, 6/9 correctable to 6/6, 6/6. Should not be colour/night blind. 6. Candidates will be inducted as officers under Short Service Commission Scheme. Short Service Commission is granted for a term of 10 years, extendable to 14 years, subject to service requirement and performance/willingness of the candidate. On completion of these tenures, officers are entitled for gratuity under the extant rules. The Officers will be on probation for a period of two years and till completion of their initial training (whichever is later), during which they are liable to be discharged if their performance is unsatisfactory. 7. Pilot Entry. 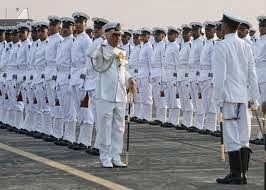 Candidates selected under Pilot entry scheme will be inducted as officers in the rank of Sub Lieutenant and undergo Naval Orientation Course at the Indian Naval Academy, Ezhimala, Kerala. This will be followed by Stage-I and Stage-II flying training at the Air Force Academy/Naval establishments. On successful completion of Stage-II training the trainees will be awarded 'Wings' indicating qualified as 'PILOT'. 8. Observer Entry. Candidates selected under Observer entry scheme will be inducted as officers in the rank of Sub Lieutenant and undergo Naval Orientation Course at the Indian Naval Academy, Ezhimala, Kerala. This will be followed by flying training at Observer school including professional training at various Naval Training Establishments/Units/Ships. On successful completion of training at Observer school the trainees will be awarded 'Wings' indicating qualified as 'OBSERVER'. 9. Training. The training is scheduled to commence in the month of Jun 2014. Only unmarried candidates are eligible to undergo training. Any candidate who is found to be married or marries while under training will be discharged and shall be liable to REFUND full pay & allowances drawn by him/her and expenditure incurred on him/her by the Government. (b) Fields such as Postal address, e-mail address, and Mobile number are mandatory fields and need to be filled. (c) Before clicking the submit button it should be checked whether all the details entered in the form are correct as you will not be able to make any corrections after saving the record. (d)After successful submission of the Application form candidates are to read the instructions on conduct of SSB and also print at the Application form with the system generated application number from the download section on the status bar. (e) Print two copies of the online Application Form having the system generated Application Number. One copy of this Application Form is to be duly signed and mailed (posted) to Post Box No. 02, Sarojini Nagar, New Delhi - 110 023 along with the following documents:- Self attested photograph, Attested photo copies of 10th & 12th class certificates along with Mark Sheets, other educational certificates and mark sheets of all semesters/years. Application to be sent by Ordinar Post only. Speed Post, Courier and Registered Post will not be accepted. Application and requisite enclosures must be properly tagged/stapled, IHQ MoD (Navy) will not be responsible for loss of enclosures, if sent loose. (a) Candidates will be issued call up for Service Selection Board (SSB) interviews based on their performance in educational qualification. If a candidate possesses higher qualification with better percentage, his hi her qualification will be considered for cut off. Integrated Headquarters, Ministry of Defence (Navy reserves the right to short-list applications and to fix cut off percentage. No communication wi I be entertained on this account. (b) SSB interviews for short-listed candidates will be scheduled from Dec to Jun 2014 at Bangalore. ests. Candidates who fail to qualify in Stage I will be sent back on the same day from SSB Centre. Stage 1 Tests consists of Psychological Tests, Group Task Tests and Interview. (d) Candidates recommended by the SSBs, cleared PABT (for Pilot Entry) and declared medicall fit will be appointed for training based on merit list and depending on the number of vacancies available. (e) Change of SSB Centre for interviews not permissible. (f) Any correspondence regarding change of SSB dates be addressed to the President of the SSB on receipt of call up letter. (g) No compensation will be paid in respect of any injury sustained as a result of tests during SSB. (h) Return 3rd AC rail fare is admissible for the SSB interview, if appearing for the first time for this Commission. 14. Male candidates who do not clear PABT/Aviation medicals and have opted for Short Service Executive (General Service) will only be considered for the same, if qualified medically & educationally (Only BE/B Tech). This is subject to availability of vacancies and on their position in the merit list. 15. On completion of basic flying training and on award of wings after commission, you would have an opportunity to fly Fixed Wing Aircraft or helicopters. This could be from an aircraft carrier, other ships decks or from an airfield ashore. You would be flying machines at the cutting edge of technology. You would actively participate in all facets of Naval Operations, i.e.Air, surface and sub-surface operations. An honorable, exciting & adventurous life awaits you as a pilot in the Navy. 16. On completion of training, would be part of the Naval Aviation Arm. As an airborne tactician your primary task would be to operate various state of the art equipment including Radar, Sonar, Electronic Warfare equipment, Communications equipment and even launch airborne weapons. You will get an opportunity to participate in all facets of Naval Operations on board Maritime Patrol aircraft and state of the art helicopters. 19. Cost to Company (CTC):- The CTC fora sub Lieutenant would be approximately Rs. 83,500/- per month. This includes Basic Pay, DA, Grade Pay, Military Service Pay, Flying Allowance, House Rent Allowance and Transport allowance. These rates are not statutory and are subject to change. 20. Privileges:- In addition to the CTC mentioned above, Navy provides Free Medical Facilities for Self & dependents, Canteen Facilities, Entitled Ration, Mess/Club/Sports Facilities, Furnished Govt. Accommodation, Car/Housing Loan at subsidised rate. 21. Group Insurance & Gratuity:- Insurance cover of Rs. 57 lakhs (on contribution) and Gratuity will be granted to the officer as per the latest rules in force. 22. Leave Entitlements:- On Commission, officers are entitled to 60 days annual and 20 days casual leave every year (subject to service exigencies). They are also entitled for 40% rail concession to any place and free travel (as per extant rules) for self and family. Leave during training period will be as per the Training Policy in force. 23. Sports &Adventure:- The Navy provides facilities to pursue any sport of your liking. In addition, one can learn and participate in adventure sports, such as river rafting, mountaineering, hot air ballooning, hang gliding, wind surfing etc. 24. Physical Fitness:- In Naval Academy curriculum, a lot of emphasis is laid on physical fitness. You are therefore, advised to remain fit through physical exercises, sports, running, swimming, etc. so that you meet the training goals successfully.